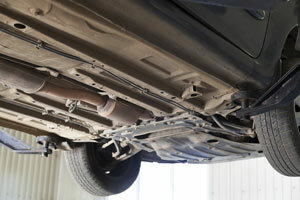 In the past, we relied on muffler shops for exhaust system repairs. However, muffler shops are quickly dying out, and now the closest shop to us is 15 miles away. Therefore, we’ve taken steps to perform these repairs on our own. Our technicians have always had the expertise required to repair exhaust systems, and now we have the special equipment necessary to become an official muffler center. So why bother becoming a muffler center? Modern exhaust systems, in particular those that conform to California standards, can last forever. However, the most expensive and least reliable part of the system has been and always will be the catalyst converter, or CAT for short. A bad CAT will result in a failed smog check, and for newer model vehicles, replacements can only be found at the dealer. Aftermarket CATs, which work with most older model vehicles, cost much less and so many customers choose to have them installed. These aftermarket CATs often come in a generic form and must be modified according to what model they’re to be installed in. Therefore, to meet the demands of our customers, we decided that a muffler center was necessary.